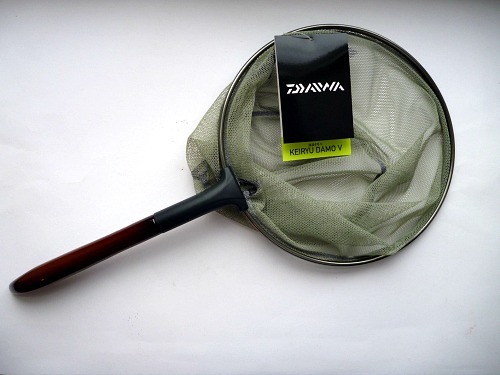 The Daiwa Keiryu Damo V is a very nice, rigid net that is well suited for tenkara or keiryu fishing. For quite some time I have carried folding nets but I have to say I have come to prefer a rigid net. 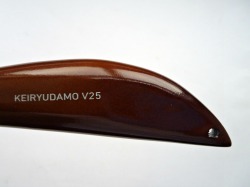 The Japanese word for the net used by tenkara, keiryu and ayu anglers is "tamo." When it follows some words, like keiryu for instance, it is pronounced and written as "damo." There is no question that a folding net is more compact in its pouch strapped to your belt. On the other hand, it is very convenient to just pull the net out of your belt and have it ready immediately, and after netting and releasing your fish to be able to give it a quick shake to get the water out of the webbing and then just slide it under your belt again. Too many people have complained about the folding nets not folding easily (or at all if they bent the hoop in their first failed attempt to fold it). The Daiwa Keiryu Damo V 25cm looks better with a brookie in it! The Daiwa Keiryu Damo V comes in two sizes, 25cm and 30cm - essentially 10" and 12" hoop diameters. The handle length is 10" for both nets. 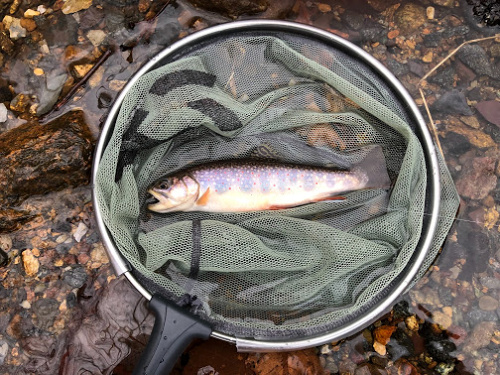 I have successfully netted 18" trout in nets with hoops a bit smaller than 10" but I would suggest the larger one if you regularly catch fish over about 16 inches. And, for fish over 16 inches, a rigid net is much nicer than one of the flexible, folding nets! For fish under 16" the smaller net is perfectly adequate and is more convenient to carry. The handles are wood, unlike the Shimano nets I carried a while ago, which had plastic handles that had a nasty habit of breaking in transit. I don't think these are going to break. The nets have a couple other nice features. There are two points where you can attach your net leash. One is on the underside of the handle close to the hoop. 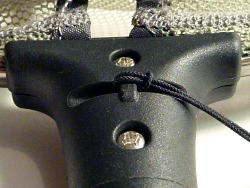 The thin loop end of the Shimano Net Leash attaches with a girth hitch through the little "tunnel" that can be seen between the two screws on the left photo. The end of the handle has a small hole that you could use instead if you wish. Personally, I use the attachment near the hoop. That keeps the net leash from catching as I slide the handle under my belt. This feature may interest you only if you are a keiryu angler (but this is a keiryu damo after all). 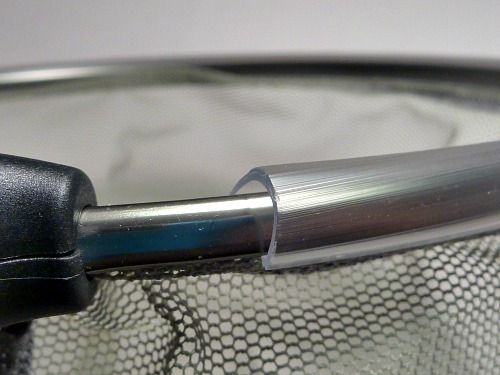 The net hoop has a removable plastic cover that protects the hoop. If it didn't have the protective cover, the hoop could get scratched when you hold it on the stream bottom to catch mayfly nymphs and caddis larvae that are dislodged as your turn or kick rocks just upstream of the net. Mayfly nymphs for illustration purposes only. They went right back into the stream after the photos. 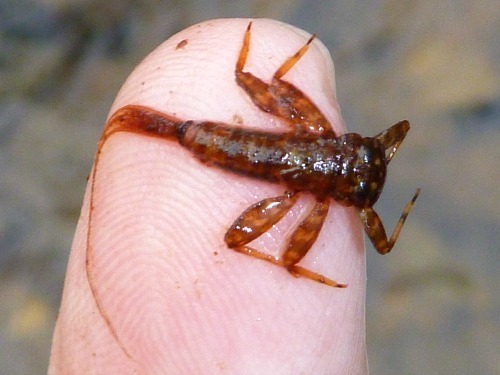 "Taking" nymphs from a trout stream is not legal where I live, and I would urge you to check the regulations where you fish. 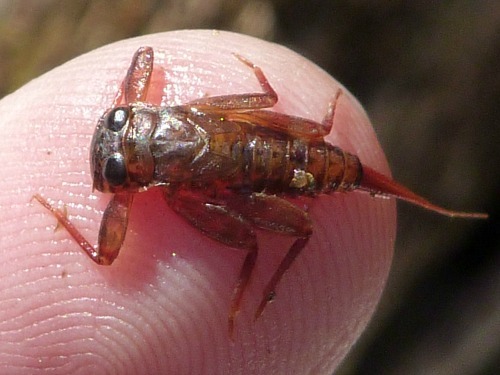 If it is allowed and if you are a keiryu angler, there is no more natural bait than a mayfly nymph or caddis larva taken from the stream you are fishing. The light colored net bag makes it easy to see the nymphs in the net, and it also provides a good background for taking photos of fish while still keeping them wet. The net mesh is woven rather than knotted, so it is a lot less likely to scrape off scales than the earliest tenkara nets that were available in the US. Please note: Additional postage will be required for international orders. Please click the correct button below.